Mahar, A. L., Gribble, R., Aiken, A. B., Dandeker, C., Duffy, B., Gottfried, G., Wessely, S. and Fear, N. T., 2017. Public Opinion of the Armed Forces in Canada, U.K. and the U. S.. Journal of Military, Veteran and Family Health, 3(2), pp. 2-3. Ministry of Defence, 2017. 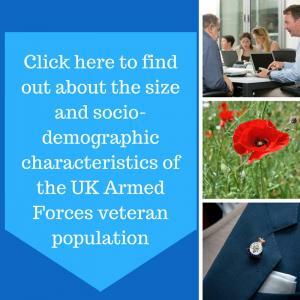 Annual Population Survey: UK Armed Forces Veterans residing in Great Britain, 2016.